Tropical Storm Harvey may have taken Houston by surprise, but places around the world are getting ready for more extreme weather due to climate change. Houston residents walk across the flooded street in Houston, Texas, on August 27th, 27. “Hurricane Harvey,” via Shutterstock. We don’t know how much the epic flooding from Tropical Storm Harvey in Texas has been influenced by human pollution of the atmosphere, but the storm has likely been worse than it would’ve been generations ago, before we started pumping massive amounts of carbon into the air. “Harvey was almost certainly more intense than it would have been in the absence of human-caused [global] warming,” writes leading atmospheric scientist Michael Mann, of Penn State University. It’s a variation of an increasingly common story around the world, and it comes down to simple physics. Carbon pollution traps more of the sun’s heat — more energy — in the air and oceans. Warmer water leads to more evaporation. Warmer air can hold more water. And more water in the air “creates the potential for much greater rainfalls and greater flooding,” Mann says. The trend is similar with heat and drought. “[Recent] heat waves in India, Pakistan, China, Europe, Africa, Americas — in almost every case now we see that our emissions are making the events more intense or longer-lasting,” says Katharine Mach, who runs the Environment Assessment Facility at Stanford University. The calamitous events of this week in Texas might suggest that we’re at the mercy of this new era of supercharged weather. But Mach, who focuses on how countries and communities around the world can respond to the growing threats from climate change, says it doesn’t have to be that way. She says many places are taking the threats of increasing severe weather events very seriously and rising to the challenge. The Netherlands, for example, “has a top-to-bottom risk management approach” to climate threats, she says. France responded to a deadly extreme heat wave in 2003 by developing an early warning system and setting up cooling centers, which Mach says helped the country better ride out another heat wave three years later. And then there’s New York City after Superstorm Sandy. But Mach says ambitious action on climate isn’t restricted to high income countries. Mach calls those changes “very compelling” and says they have made a big difference in storm mortality in the country. She says similar strides are being made in parts of Africa. “We … see it in terms of community-based adaptation across the African continent,” Mach says. “Some of the most ambitious city-scale action, for example, has happened in Durban, South Africa. We see communities … coming together to think about what does [climate change] mean for planning for increased risk of flooding in some places, increased risk of drought in others. And [these are] communities that are already more on the margin,” compared to here in the U.S.
Got science? Get monthly doses of free educational resources from the SciFri Educate team. And not all places that have the resources to respond well to the threat have been. Texas itself is a prime example. It’s one of the most vulnerable places in the country to the effects of climate change, from raging floods to searing heat. But the state’s leaders have generally rejected any concern about climate change, and the state has taken very little action to prepare for it. “We’re already too late in some respects,” former state environmental regulator Larry Soward told The World in 2014. Soward served under former Texas governor Rick Perry, who while in office rejected the overwhelming scientific evidence for human-caused climate change, and who now leads the U.S. Department of Energy. But Soward parted ways with the Texas Republican establishment on climate change. “If we don’t start doing something today, we are going to have significant costs, in economic damage, property, lives, environmental damage, that could have been avoided to some extent, ” he said at the time. 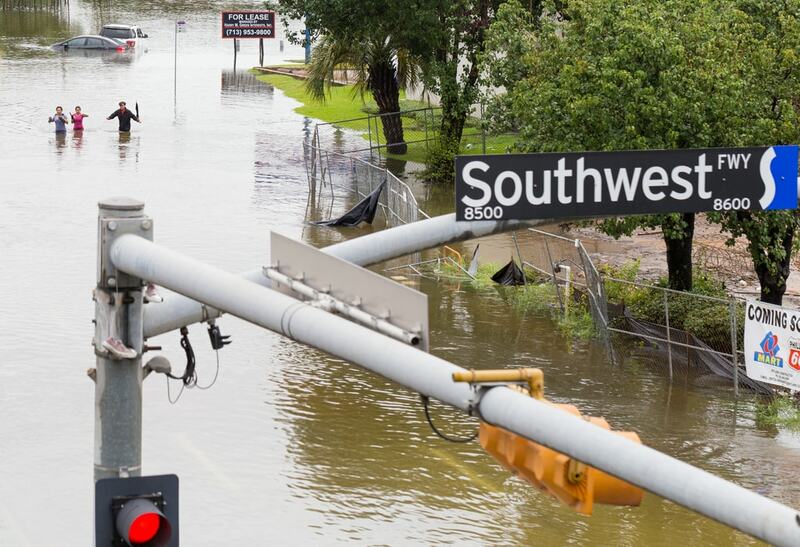 Texas’s reluctance up to now to squarely face the risks of climate change drives home another key lesson from Mach’s work: that the barriers to climate change adaptation aren’t just about resources. And Mach says the U.S. federal government is moving in that direction. Neena Satija of the Texas Tribune contributed to this report. Peter Thomson is an environment editor at PRI’s The World. Is there a link between climate change and stronger hurricanes? In Marin County, California, augmented reality binoculars are helping locals visualize sea level rise—and plan for it.